It’s time to go with the flow and let Mother Nature do her thing! As humans, we feel the need to fix everything. We see a problem and we instinctively try to find a solution. Unfortunately, Mother Nature does not come with an instruction manual. When you are unfamiliar with the task at hand (landscaping for example), your ego can overcome your ability to ask for help; leaving you with a bigger mess than what you started with. When it comes to lawn maintenance, there is more than meets the eye. Not everyone is equipped with the right skills and knowledge to take care of their lawn. Most homeowners begin their landscape maintenance journey with high hopes and confidence that they can do it on their own and burn out quickly when they can’t diagnose or resolve their issues. You don’t have to conquer your landscape battles on your own! How does the weather come into play? Too much rain can cause fungal issues, not enough rain can cause dehydration. Mild winters or springs (major trend this year) can cause more weeds and a longer transition time out of dormancy. Needless to say, in our industry, the weather controls everything. We are truly at the mercy of what Mother Nature decides to throw at us each day. Our decisions have to be prompt, diligent and meticulous. As you can imagine, having to base those decisions off of a prediction can be stressful to say the least. Don’t be afraid to call the experts! Our landscapes are truly a force to be reckoned with. Luckily, this isn’t our first rodeo! After being in the business for 20 years now, we have learned to accept and respect the ebb & flow of Texas’ seasons and unpredictable weather patterns. Is your choice of turf variety hindering the full potential of your landscape? Bermuda lawns need abundant sunlight to thrive. If your landscape does not allow for at least 6 hours of direct sunlight per day, it is not a practical growing environment for Bermudagrass. St. Augustine on the other hand is known to only require 4+ hours of direct sunlight but it comes along with its own baggage. While it is a good alternative, St. Augustine is not native to Texas and is seemingly always under stress unless put in the perfect conditions. It has been especially stressed this year due to the major freeze damage that has occurred from the previous winter. It is also extremely prone to fungal issues like Brown Patch and one in particular that can cause significant damage to the health of the turf – Take All Root Rot. Although Bermuda & St Augustine are the usual “go to” picks, you do have other options that are appealing to the eye and fairly tolerant to shade & pesky diseases! It’s time to get practical! 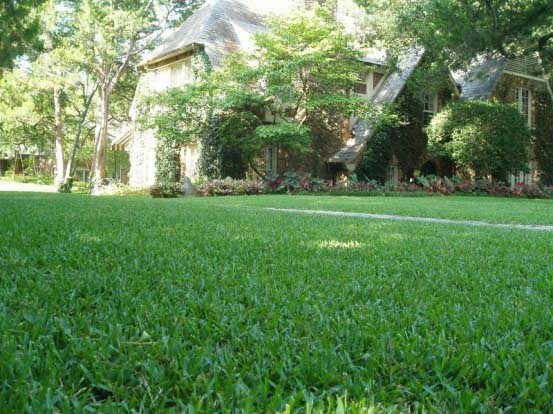 We know first hand as Texans that we love our lawns and our shady trees! But just like most things in life, you can’t have your cake and eat it too. It may be time stop fighting a losing battle and start accommodating your growing environment instead of disrupting it. Stop trying to predict her next move and go with the flow! The weather and seasons are always changing. Our lives are much simpler when we accept the changes instead of trying to fight them. Most grasses do not survive in significant shade. Maybe install some large beds that expand out about halfway to the canopy of the tree. 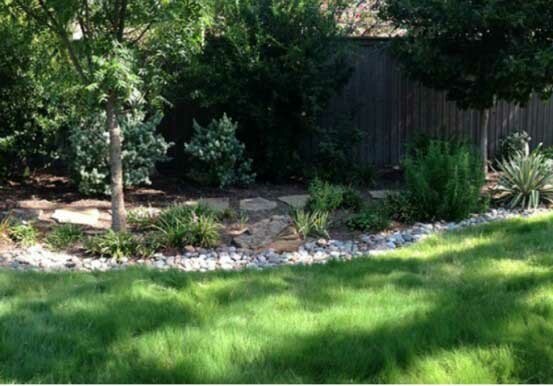 You could fill the beds with shade tolerant ground cover, river rock or hardwood bark mulch. You can even install a water feature or if you need some good luck- throw a garden gnome in there! If you don’t know, ask! Don’t get yourself in a pickle because you don’t want to ask for help. We are here to provide practical, natural minded advice and treatment for your landscape. We want everyone to win!